Bubbles - A Finished Quilt. Remember a little while ago I showed photos of a squares quilt I was working on? Well... I guess I didn't mention the sqaures were only one side of the quilt. Ages and ages ago I had the idea of making a coverlet of circles. Lots and lots of two sided circles stitched together, some overlapping and some barely touching except for a few stitches. I could picture this bubbly coverlet hanging over the foot of a bed, or being a double sided curtain for a glass door. It was one of those ideas that didn't really work very well, and after sewing a few circles together I packed them away and promptly moved onto the next project. 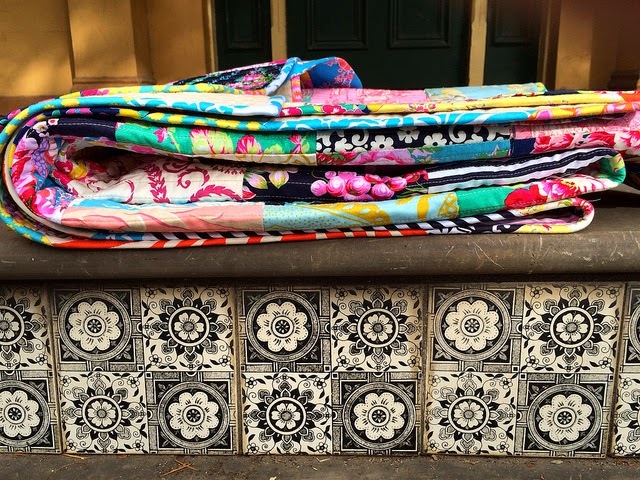 Fast forward to a couple of weeks ago when I got my order of Sis Boom's Beauty Queen fabrics. 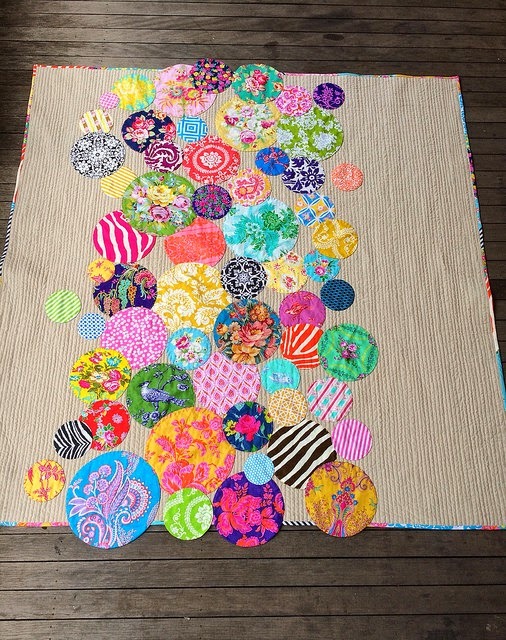 I was admiring the pretty stack when I remembered my bubble circles and decided it was about time I brushed the dust off and used them in a quilt. So I cut some Beauty Queen into squares, added lots of different Sis Boom fabrics from past ranges and soon had a finished flimsy. After auditioning lots of different backing fabrics I settled on natural linen. It's not as cold and stark as white tones, and I like the texture of linen. The reason I needed a nice friendly neutral colour was because it was to be the back drop for the flurry of colourful circles. 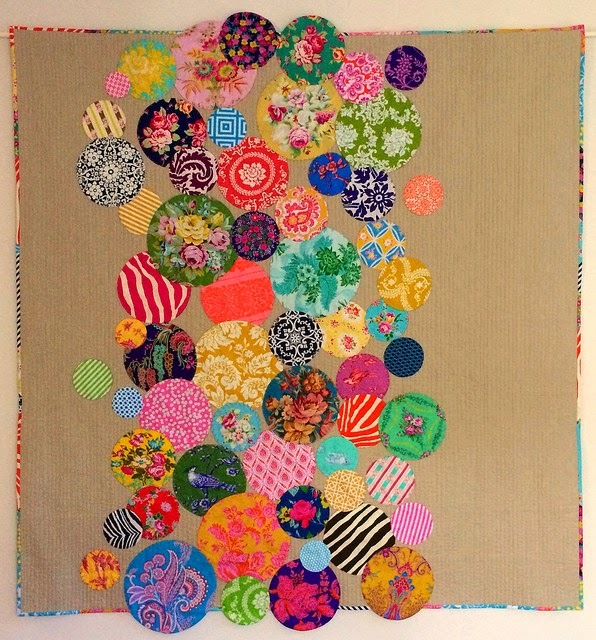 So as you can see the squares quilt is really a very bubbly circle quilt. But it looks just as pretty on both sides. Of course there has to be a folded quilt photo to show off the colourful scrappy binding. The name Bubbles might be a bit plain but it's what I called the circles from the very beginning and the name has stuck around. Not like these short lived bubbles photographed with the quilt. When was the last time you blew bubbles? I'd forgotten how magical it is to watch them float through the air. So that's it, the story of Bubbles, the quilt that wasn't as square as it looked. Designed, pieced and quilted by me, Rachaeldaisy. Fabrics: Except for the linen all the fabrics are Sis Boom from lots of different ranges. The linen has been in my cupboard for a while so I'm not sure of it's details. 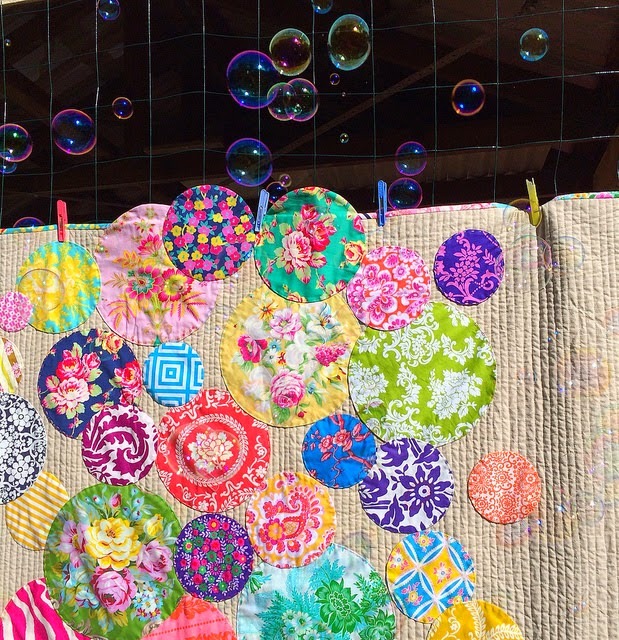 Another absolutely fabulous quilt - and yes, I do love blowing bubbles but it has been ages! Oh I can't tell you how much absolutely LOVE this quilt. So stunning. The circles are perfect for those stunning fabrics and the square side is beautiful too. Beautiful as always. Where was the photo shoot? Gorgeous! 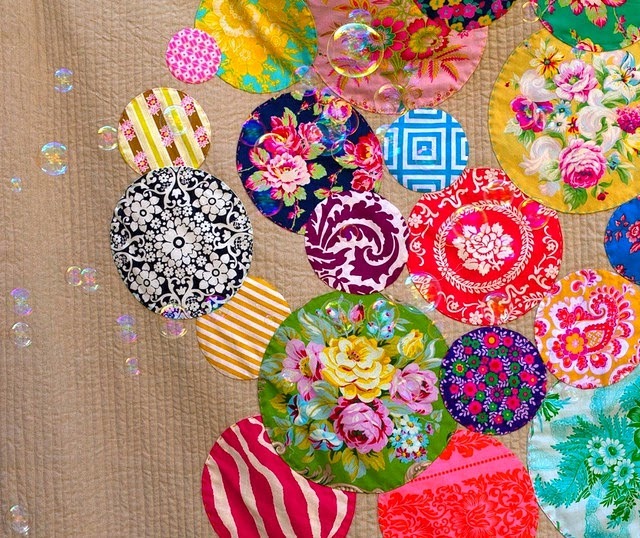 Love the repurposed bubbles on such a happy quilt! Another fun finish Rachael! I haven't blown bubbles for a L...O...N...G time! Although I did have a couple of glasses of the drinkable sort last night! And maybe you could have a bubble bath tonight then you could wrap yourself in your pretty Bubble quilt! This is so adorable!! I love your colour choice, and ability to think outside of the square. Some designs take time to develop, don't they? This one obviously needed to sit until it was ready. 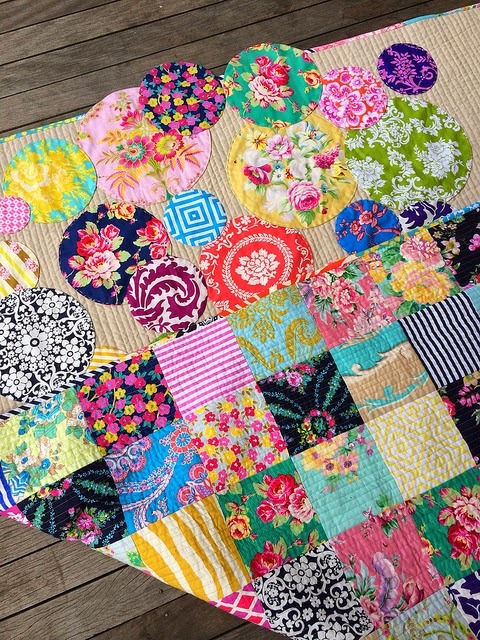 Rachael, I just love, love, love this quilt! You are so talented! Fabulous! This is my idea of a really great quilt! Love your bubbles! This has worked really well with the linen background! The photos with the bubbles floating g around Bubbles catching the light is gorgeous! Absolutely lovely! 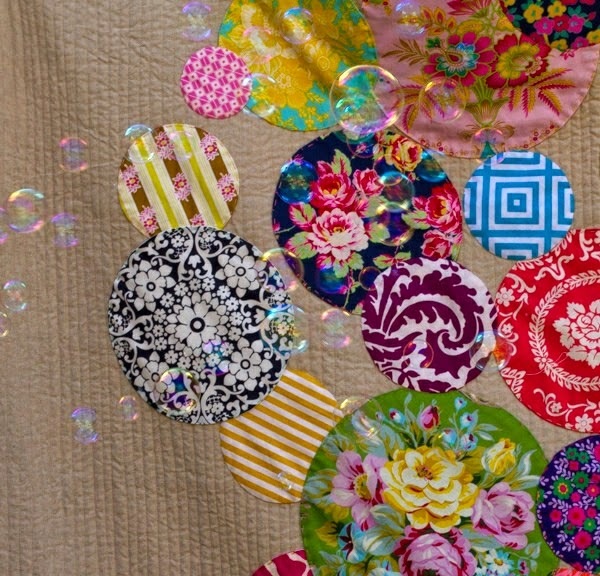 The bubbles are a great idea, love how you have overlapped them and allowed them to float over the edges of the quilt. The squared back is very pretty, so many gorgeous colours and fabrics. Yes, blowing bubbles if fun - I get a bit of practice with my little granddaughter! It is fun to let some ideas percolate and see what is to become of them. 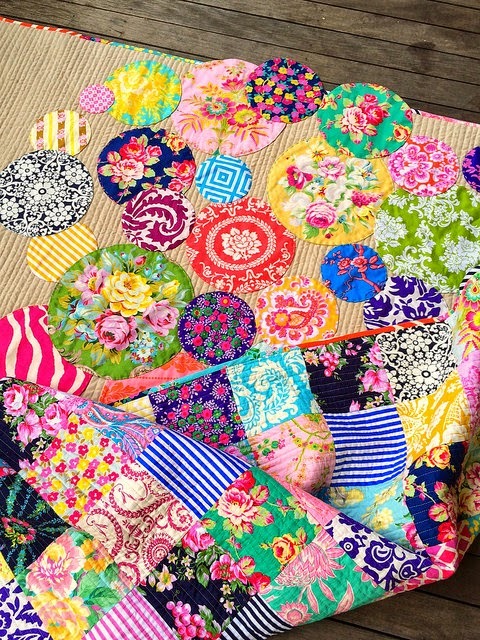 What a creative idea to incorporate them into your quilt! Two quilts in one, circles and squares, a grid and chaos, such a perfect balance in one quilt. The linen is a great ground for those buoyant bubbles. What fun! how fun! What a great 2 sided quilt! 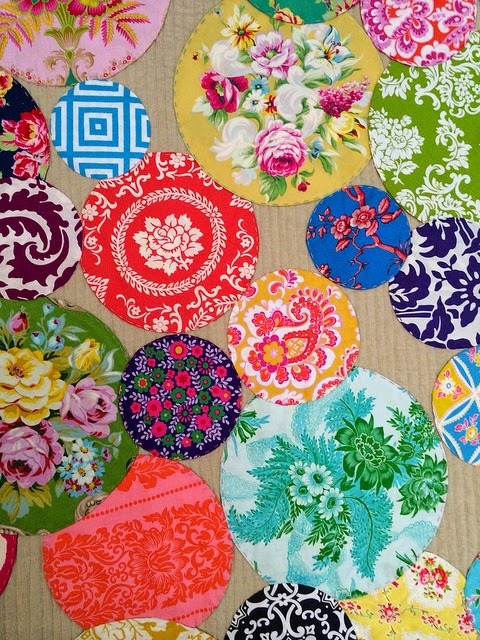 The fabrics are so pretty and look great in circles. The bubble photo is so so fun. I love to blow bubbles. Wonderful scrap binding. You make such happy quilts, they always make me smile. This made me laugh! It reminded me of something Eli or Lily would do. In your case: "Look at this quilt top. Isn't it beautiful? Tricked you - it's the back (or it has two fronts?)". I love that the bubbles extend beyond the straight edges of the quilt. And the linen. So beautiful. I've not used much linen before, but the little I have I adore. Your straight line quilting is perfect for this quilt; lines, squares and bubbles in perfect harmony with each other! I love it! The Sis Boom prints are so bright and pretty and the circles are gorgeous. Bubbles are so fun, my kids love them! Clever use of your Bubbles! What wonderful fabrics Sis Boom has..... You've show cased them perfectly. 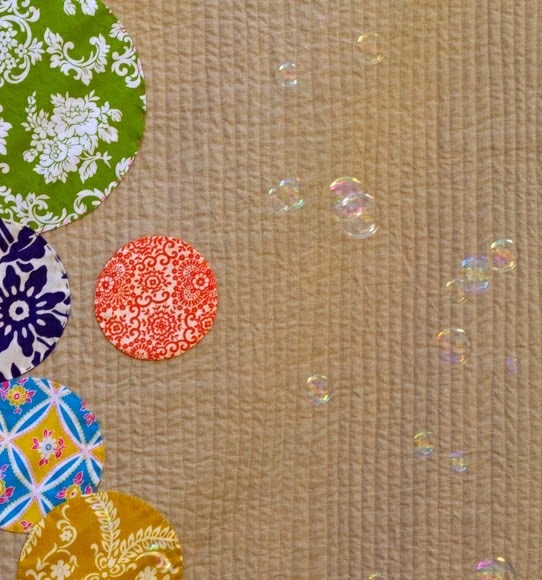 I love the quilting....it makes the bubbles look like they're floating straight up in the air. Some quilt ideas just need their time to resonate! It this one turned out wonderful!! It is a beauty. Oh how fun! It's beautiful!!! 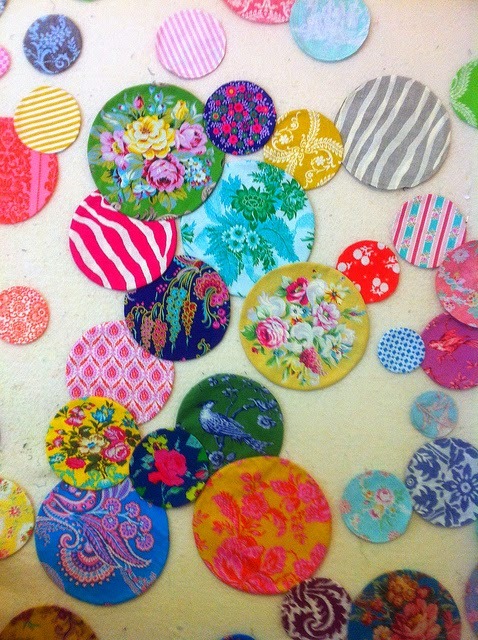 I LOVE all the pretty fabrics you've used! WOAH. Absolute stunner! Love this idea and the fabrics are perfect. I love it! It's as effervescent as you! Lovely styling, too! What fun to have your pretty bubbles floating off the edges! Another original and happy creation! I could look at those bubbles all day. So much interest in your fussy cutting there. How fun! I love the story of this quilt. 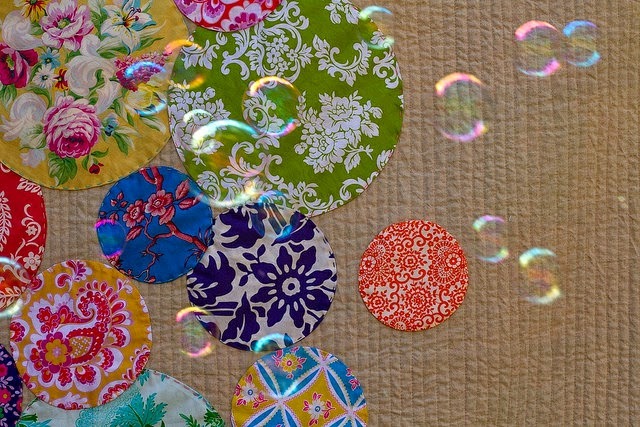 The bubbles photo is perfect and those fabrics are yummy. I love it! And the fact that you were able to incorporate a project you'd put aside...icing on a beautiful Sis Boom cake. Great job!! Can't wait to see where your imagstive design mind will take us next. 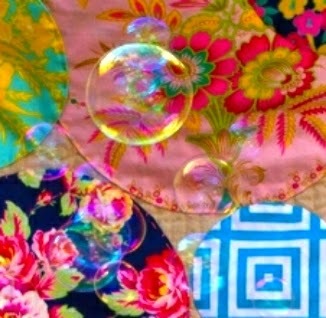 Love the photos of the soap bubbles you blew to be I the picture of the quilt. Love all the circle play with the contrast of the squares. The bright fabrics zing on the linen background. Super fun! How much fun is that! And the bubbles photo shoot made me laugh :) What a fun quilt, and I love the Sis Boom fabrics, I've long wished to make something with them. Nice and clever girl, how cute. 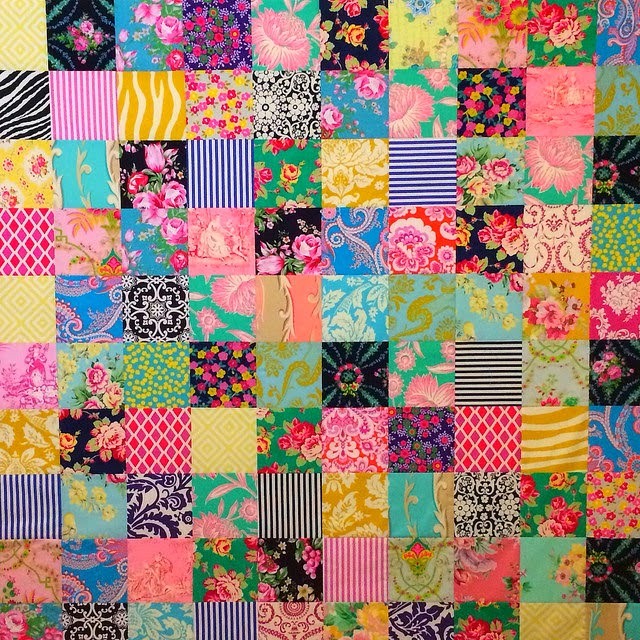 Was thinking this would be an excellent idea for a baby quilt and it could even be embellished with buttons or yoyos in their centers for an older female child or teenager, or someone old as me, lol. Love the coverlet of circles idea! That is awesome! I love it when things go away for a while and come back more perfect than you could have imagined the first time. You are an amazingly creative quilter. I thought the squares on their own were gorgeous, but the addition of the bubbles makes it stunning. It is so good that you did not give up on your original idea. And I love the photos with the bubbles floating around!! Brilliant idea for a two in one! Grande idea, bellissima trapunta duoble face! 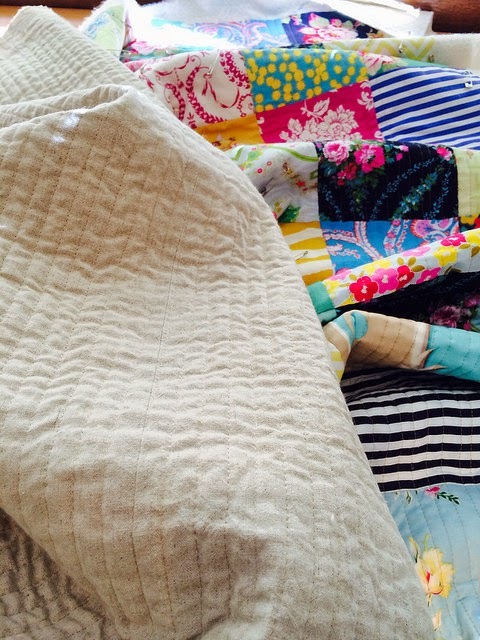 Top notch all around, great post, story, pics, fabrics, & quilt! Don't you just love it when a plan comes together? Even if it takes couple twists and turns along the way. You make me smile as always. Just so so neat! I'm glad you picked it back up. It really has the feel that the circles are hanging in the air like a wind chime or curtain. What a great rescue! The bubbles are fabulous - as effervescent as you!! What a wonderful quilt! I love your Bubbles. Isn't it funny how things turn out sometimes? Not what you started out to do, but better! The quilt is very "you"! Beautiful! Rachael another glorious burst of colour when I come to visit this Saturday morning! The bubbles behind are so cute! Loving the quilting on this.... I haven't quilted many quilts but I'm hoping to start Diamonds at Large today and you have given me some ideas. I'll do the ditch first. Doesn't look like you've done it here...I'll have to have another look LOL! I'm too inexperienced to know whether it is always necessary. Your quilting is SO effective here! Love how you put the quilt details in also! Absolutely beautiful! I love that the bubbles extend off the sides of the quilt. 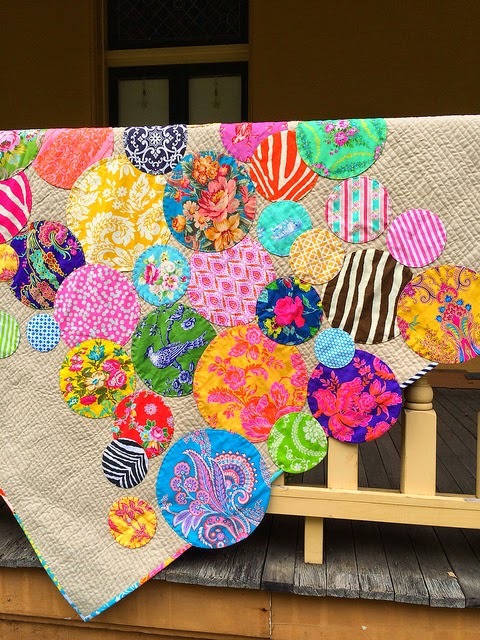 Did you quilt before you attached the circles? I just live your Bubbles quilt. Great fabric choices. It would have taken me a long time to decide how best to arrange tthem. Kudoes! You are a clever clocks! 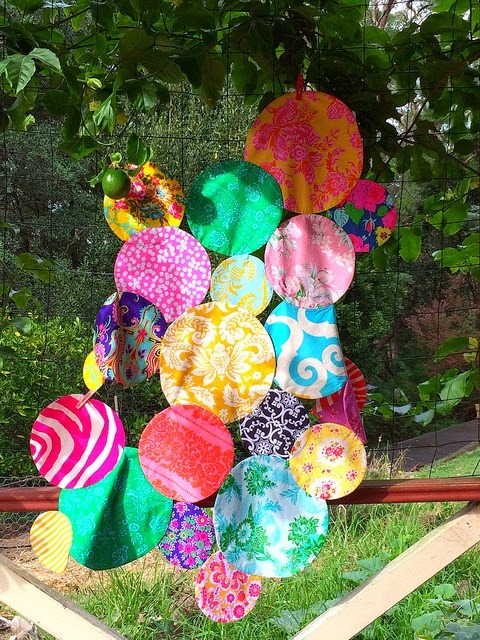 Great idea for resurrecting your circles. So many yummy fabrics circulating on your quilt. I love the straight line quilting. 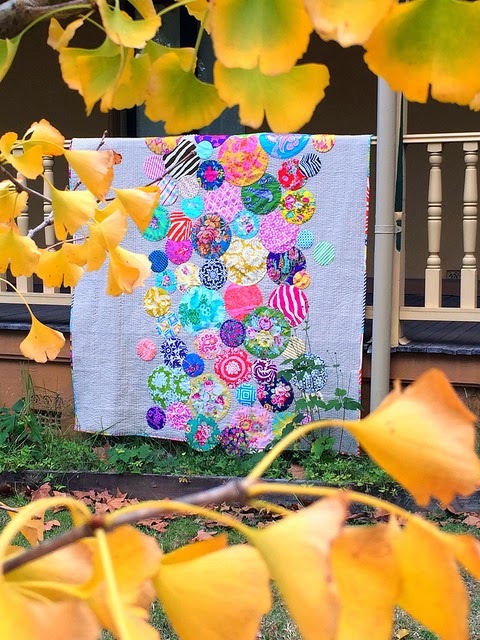 What a wonderful, fun and modern quilt! it looks amazing and the bubbly photos look wonderful too. Congratulations. What a wonderful ideas you get. Shows that there is always use for everything even if it doesn't "click" the first time. I absolutely love this quilt. So I'm over on facebook, and Quiltmania are telling me they have a new magazine out, and I'm looking at the cover quilt and I'm all ????? I know that quilt! Where do I know that quilt from? I love it when project "simmer" for a while before they re-emerge to become world class works of quilty art! Your patience was well rewarded and those circles shine!